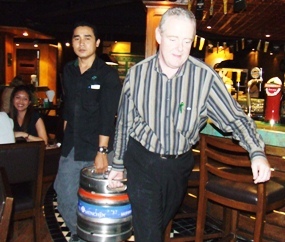 General Manager Cathel Brett and staff carry in a beer keg for the Oktoberfest party. Beautiful fraulines prepare to quench their thirst with a large German lager. Niki Martini entertains the Oktoberfest crowd. The hotel may be American and the restaurant Irish-themed, but that didn’t stop the Marriott Resort & Spa’s Dicey Riley’s pub from putting on an Oktoberfest celebration. 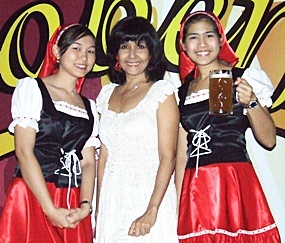 German beer, sausages and entertainment were on tap at the Second Road bar Oct. 2-9 with General Manager Cathel Brett and the Thai staff putting on their best Bavarian accents. The menu featured bratwurst, Muenchner Scbweinebraten, Bayrisches Biergulasch, and chicken schnitzel. 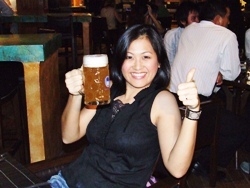 And, of course, tall steins of the German beer were on every table. 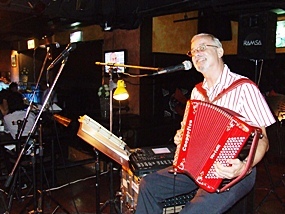 Music was provided by well-known Swiss musician Niki Martini. While now celebrated worldwide, Oktoberfest has its roots in the German wedding of King Ludwig I and Theresa of Bavaria in 1810. The festival was so good, it was repeated each year.